Well, we are now 5 big days away from moving onto military base housing here in wonderful Minot, North Dakota. I'm so excited and nervous! More than that, I'm ready to meet more people. I'm ready to meet nice people with good hearts. Being a military spouse, I knew would be hard but I never thought I'd have that much difficulty with it. I was wrong. This lifestyle challenges me everyday. I cook dinner because I believe after working hard all day, my husband deserves to walk into our door to a hot meal. I'm getting used to using the microwave. There's boxes all over our apartment and did I mention we are doing a DIY move. Lord help us. I'm just ready to get into a real house and not share a floor with someone. We have all hardwoods throughout the house. It's a 3 bedroom, 2 bath home with a basement. I'll be sure to put up pictures once we move in. We all lurveeee before and afters, right?! Here's a few pictures of our apartment and all of our boxes. Just recieved a call that I was being offered a position at the Commissary! Pretty stoked! Also, moving in 2 weeks. Thank the Lord, I cannot possibly wait any longer to decorate! Let's cross our fingers that I am given enough time to do all this decorating before starting the new job! We also fell in love yesterday, with Tito. 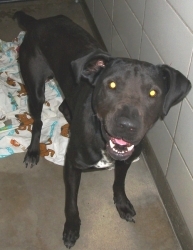 Tito is at our local animal shelter and is a great dane/lab mix. He thinks he is a lapdog and is the biggest sweetheart in the world. We are crossing our fingers and hearts that he will be part of our little family soon. 2:04 a.m. I am w i d e awake. Insomnia, maybe? Or just that little brain of mine working away, stressing about every small detail of our life together. I have always loved to let my hand guide the feelings and emotions of my heart. Letting my hand convey what my heart is feeling and when my heart is hurting or happy. Stating the obvious, I love writing. I thoroughly enjoy it, among other things. I'm a woman that enjoys the simple things in life yet demands the best. I love to feel loved and I love to return that feeling. I love every peice of what "sappy" can entail. I just love to be in love, I would love to stay in this moment forever. I love waking up next to my best friend and knowing that I get to fall asleep with him everynight puts me at ease and makes me feel like the safest woman on this Earth. If he only knew, how much I loved him and how thankful I am to have my best friend as my husband. I have a list of new year's resolutions, just like the billions everywhere else but I really and truly want to stick this resolutions. The first one was be a better wife. Be more patient and kind. Love more. Learn more. Laugh more, cry less. Explore together more. Travel more. Play more, stress less. I'm not the world's worst wife but I am certainly not taking the award of best either. I have my days/nights like tonight, where I'd give anything in the world to show Ryan what he means to me. Maybe one day, he will know.